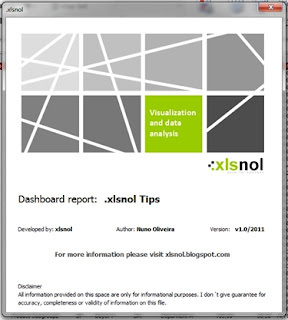 .xlsnol: SplashScreen... Identify your work! All the complex reports, dashboards (and so on) that I do, I always like to identify them with a "splashscreen". Why? Because it will be easier to identify who have done the work if anything need’s to be clarified. Sometimes we wish do more with Excel for data analysis and that’s what I try to do. With this information it will be easier (too) receive suggestions, feedback, questions that can improve our work, creating an excellent final tool for our business.